I couldn’t think of the right words to describe “The Nature Boy” Ric Flair right now. It’s just so unreal that the 36-year career of “The Man” has ended after he was defeated by “The Heartbreak Kid” Shawn Michaels at WrestleMania XXIV last March 30th. Though I know it was bound to happen, I still get goosebumps just seeing the photos of his emotional final WWE match; the way he staged his retirement, a “career threatening match” against the person who he influenced and inspired to become “one of the boys”, it was classic. I wasn’t at the Citrus Bowl to watch the spectacle; I was satisfied enough to see the spoilers on WWE.com. After all, sooner or later, I will get a chance to rent a WrestleMania DVD from video outlets around. Anyway, it all started when Vince McMahon told Flair on one episode of Monday Night Raw that the first match he lost will be his last (We all know it’s kayfabe though). The reality is that “Naitch” felt it is time to retire as he isn’t getting any younger; the bumps and bruises he received every match just adds up to his aging physique. That “win or retire” stipulation was a hint of his impending retirement, and something more. However, the way I see it, they wouldn’t let him retire unless it was at the “Granddaddy of ‘em all”. They set him up against young guns like Montel Vontavious Porter (I couldn’t call him MVP because he isn’t), Mr. Kennedy, and his “students” Triple H and Randy Orton. 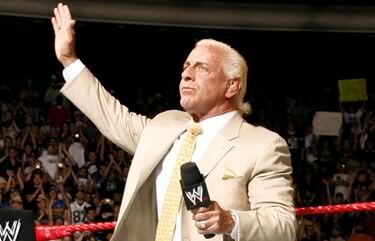 The night before WrestleMania, Flair was the first ever active wrestler to be inducted into the WWE Hall of Fame. It is ironic, however, as he was put into retirement by his friend HBK, thus making him an active-wrestler-slash-Hall-of-Famer for one night only. Two more things: 1) I honestly think the Nature Boy is more charismatic than Hulk Hogan; and 2) this wasn’t necessarily a news, but the Nature Boy is definitely SUGOI.